VENDORS WANTED: The Meriden Civil War Encampment is seeking vendors for its Civil War Encampment event, Saturday, October 6, from 9 am to 3 pm at Dossin Beach Park at Hanover Pond, Oregon Road, Meriden CT.
BE PART OF A LIVING HISTORY EVENT: This historical event honors the 150th anniversary of the American Civil War and recognizes Meriden’s contribution to the war effort during our country’s most turbulent time. Financial support for this community event provided by the Meriden Foundation. Quinnipiac River Watershed Association, Meriden ArtsTrust, Inc., Meriden Historical Society and the 2d Connecticut Volunteer Heavy Artillery. The Quinnipiac River Watershed Association (QRWA) held its 2nd Annual Midsummer Celebration on July 22 at its Meriden headquarters on Oregon Road. The Midsummer Celebration invited everyone to enjoy the outdoors—a Butterfly & Bee Garden, a hike in the woods or paddling on Hanover Pond—so much natural beauty in our own backyard and throughout the Quinnipiac River Watershed area. A preview of Oct. 6 Civil War Encampment at QRWA’s Midsummer Celebration. 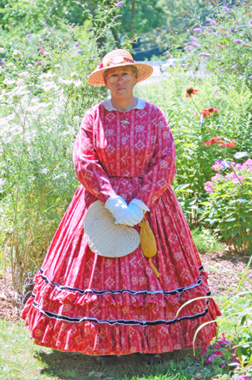 Marge Bucholz of the 2d Connecticut Volunteer Heavy Artillery (SCVHA) stopped by in her 1860’s era day dress that one wears when going out to visit. Even at 85 degrees the long dress was comfortable; hoops prevent skirts from clinging. Midsummer Celebration music was performed by the Central Connecticut Civic Youth Orchestra, a project of the Meriden ArtsTrust, Inc. (MAT). QRWA and MAT will team up again, joining SCVHA and the Meriden Historical Society to present a living history Civil War Encampment at Dossin Beach Park. The events are sponsored by the Meriden Foundation and include a Civil War Remembrance Concert on Friday, Oct. 5 and the Encampment on Saturday, Oct. 6, 2012. Join Marge and the 2d Connecticut Volunteer Heavy Artillery as they share what life was like during the Civil War. A full day of entertainment, education and fun for all ages is planned. Free admission. Free parking. Free shuttle to site. Food and beverages available for purchase. 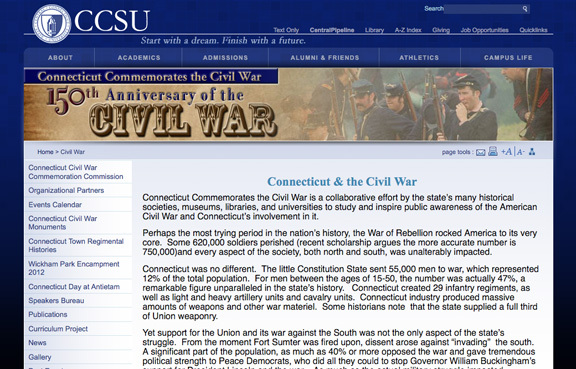 The planning committee of Meriden’s Civil War Encampment is happy to announce our event listing on Connecticut’s premiere Civil War website: Central Connecticut State University (CCSU): Civil War where you can also learn about Connecticut’s and your town’s involvement in the American Civil War. Connecticut Commemorates the Civil War is a collaborative effort by the state’s many historical societies, museums, libraries, and universities to study and inspire public awareness of the American Civil War and Connecticut’s involvement in it. Perhaps the most trying period in the nation’s history, the War of Rebellion rocked America to its very core. Some 620,000 soldiers perished (recent scholarship argues the more accurate number is 750,000) and every aspect of the society, both north and south, was unalterably impacted. Connecticut was no different. The little Constitution State sent 55,000 men to war, which represented 12% of the total population. For men between the ages of 15-50, the number was actually 47%, a remarkable figure unparalleled in the state’s history. Connecticut created 29 infantry regiments, as well as light and heavy artillery units and cavalry units. Connecticut industry produced massive amounts of weapons and other war materiel. Some historians note that the state supplied a full third of Union weaponry. Friday, October 5 – 7:00 to 8:30 p.m. — Civil War Remembrance Concert, Lincoln Middle School Theater, 164 Centennial Ave., Meriden, CT — The kick-off to the next day’s event. See below. 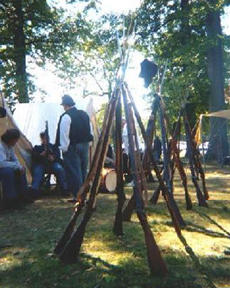 Saturday, October 6 – 9:00 a.m. to 3:00 p.m. — Civil War Encampment, Meriden CT — Located near the original site of Camp Tyler, a training camp for the First Regiment Connecticut Volunteer Cavalry and the First Battery Connecticut Volunteer Light Artillery, the 2d Connecticut Volunteer Heavy Artillery volunteers will act in the roles of militia and the ancillary but indispensable players associated with the camp, such as washerwomen, cooks and blacksmiths. An historical event to honor the 150th anniversary of the Civil War and to recognize Meriden’s contributions. The event is a collaborative effort of the 2d Connecticut Heavy Artillery, Meriden Historical Society, Meriden ArtsTrust, Inc. and Quinnipiac River Watershed Association and is made possible through a generous grant from the Meriden Foundation. Several area non-profit groups are working to produce Meriden’s Civil War Encampment, a Living History event to honor the 150th anniversary and recognize Meriden’s contribution to the war effort by focusing on social, economic and cultural practices during our country’s most turbulent time. We plan to have a spirited day filled with varied activities for all ages. Stacked Arms at a previous encampment. Photo courtesy of 2d Connecticut Volunteer Heavy Artillery. Welcome to our new blog. Over the coming months, this is where you’ll find the most current news about Encampment day; web pages outlining program schedules, travel directions and parking, and much more.